Adult Irish Dancing: Non-Competitive and fun. See the video of these Irish dancers below. American Dance Institute also offers Irish dancing lessons for adults, teen Irish dancing, kids Irish dance classes for ages 8-12, children's Irish dance classes for ages 5-7. We are not currently offering Adult Irish dance lessons at our Magnolia location. Check out our Greenwood classes. We are not currently offering Adult Irish dance lessons at our Shoreline location. Check out our Greenwood classes. Irish dancing is fun, energetic and highly aerobic. It’s also one of the most beautiful and inspiring dance styles on earth. We’ll get you started in this wonderful Irish tradition that mesmerized the world through the River Dance performances. Beginning level students will learn the basic jig and reel steps and put them together into simple solo and ceili (group) dances. Intermediate level students will include more complicated patterning and preparations for hard shoe. Comfortable dance attire and Ghillies for ladies, jazz shoe for men. Irish Dance: Adults and kids performing at a recent Artwalk festival at our dance studios in Greenwood. "Just as in all excellent schools, the quality of the teacher makes all the difference." "Janelle is a wonderful instructor and caters to all of the experience levels in the class. She makes you feel at ease and that Irish dance is meant to be enjoyable. I had so much fun." 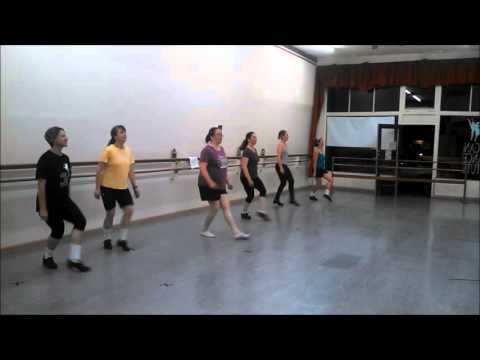 Jennifer M.
What to look for in an Irish dancing class! Look for non-competitive Irish dance classes where everyone is friendly and you'll always feel welcome. You'll want an Irish dancing class where the teacher understands that the pace of the class has to be good for you. Insist on a dance studio with specially designed 'sprung' wood floors that 'give' to protect your feet and ankles. Avoid studios with regular wood floors and heaven forbid, run away from dance studios with concrete floors. Patronize schools with accommodating school policies like a 100% money back guarantee if you don't like your class for any reason. Most importantly look for a school that has expert dance teachers who know how to give you personalized attention ad you'll learn faster. What do adult students say about this school? A pair of Ghillies, a special shoe for Irish and Scottish dancing. It laces along the instep and has no tongue, especially those used for Scottish country dancing. Besides Irish Dancing classes, we offer several other dance classes for adults including Ballet, Jazz, Contemporary, Irish, Flamenco, and Tap. Read a summary description of these classes on our Adult Dance Program page. Irish dancing instructor, Janelle Jones, helps a young student with make up before a performance. I have very little to go on, since I haven't been able to watch a class --- but Fiona loves it, go I say: GREAT! Janelle is wonderful with my daughter! My daughter is a bit shy and Janelle knows how to pull her out of her shell. Couldn't wish for a better instructor. Janelle is an awesome teacher! She always takes the time to help me when she sees me struggle. Janelle is great and always pushing us to improve our technique. She handles multiple concurrent class levels well. She's able to simply and describe what you need to do it multiple ways until you understand. She's really funny too so that's a plus! We love Janelle. She pushes the students and also provides a fun learning environment. 8 additional students rated Janelle Consistently Awesome-5 stars. Janelle Jones began Irish dancing at the wee age of 5 and competed on the West Coast and in Canada until the age of 13 at both the local and National level. With the frenzy of River Dance, she started assistant-teaching in 1997. In 1998 she rekindled her passion for competition and rejoined the Comerford School of Irish Dance. With a new enthusiasm, she competed on the 1999 Nationals Teams, and qualified at the Western Regional’s in both solos and teams for the 2000 World Championships. She would qualify and compete at the World Championship level again in 2002 & 2004 placing 4th and 3rd respectively for team competitions. Janelle has a desire to share her passion for Irish Dance and watch each student grow – no matter what their age or experience level. She has been teaching Irish Dance at ADI since 1998. Janell Jones in an traditional Irish dance competition dress.